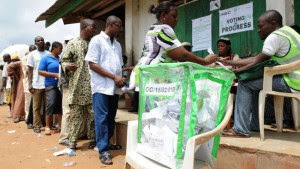 The Saturday local government and council elections in the Federal Capital Territory, failed to meet expectations, when out of 2,376 registered voters in five polling units , only 60 electorates Voted. In the Federal Capital Development Authority (FCDA) quarters, Wuse 2, where the poor outing in the election was witnessed, it was like a dead zone as voters were conspicuously absent. This could not be attributed to the heavy rainfall that occurred during the election, as the units, until the rainfall which started at 1pm , still had few electorates at the polling units. Meanwhile, a mild drama occurred when towards the end of the election, the party agents of the All Progressive Congress(APC) approached the electoral officers to release the remaining ballot papers to them, since according them, the already signed ballot papers by the electoral officers, which was done with anticipation of good turn up, would be invalidated . However, the position of the electoral officers on the request was unknown, as the People's Democratic Party (PDP) agents who seemingly felt threatened by the request kept a close check on the officials and other agents. Announcing the counted collective results from the polling units , the presiding officer said the APC scored 52 votes for the Chairmanship contest, while the PDP had eight votes. There was no invalid vote recorded . Also, in the councillorship tussle , the APC scored 50 votes while the PDP scored 8 votes. Two votes were considered invalid. All other parties had zero votes, said the presiding officer.